It may seem strange to use olive oil in a cake, but you will be surprised by the delicious result. I strongly recommend using good-quality olive oil, as its complexity and depth of flavour will shine through when the cake is baked. This cake lasts well and actually improves after a day or so if wrapped and left to mature in the fridge or an airtight tin for up to 3 days. © 2019 Amber Rose / Kyle Books · Reproduced with permission. Preheat the oven to 170°C. Grease and line a 20cm loose-bottomed cake tin. Put the dried blueberries in a small saucepan, cover with 300ml water and bring to the boil, reduce the heat and simmer for 5 minutes. Remove from the heat and set aside. Mix all the dry ingredients in a bowl. In a large mixing bowl, beat together the olive oil, maple syrup, egg yolks and vanilla extract using an electric hand mixer. Whisk for about 5 minutes, or until the mixture is smooth and thick. Stir in the apples, drained blueberries (or sultanas) and lemon zest, then gently and carefully fold in the dry ingredients. In a separate, clean, dry bowl whisk the egg whites until stiff peaks form. Very gently fold a third at a time into the cake mixture, trying not to knock out the air. Scrape the mixture into the prepared tin and bake in the oven for about 1 hour or until the centre springs back to the touch. Remove from the oven and set aside to cool in the tin. 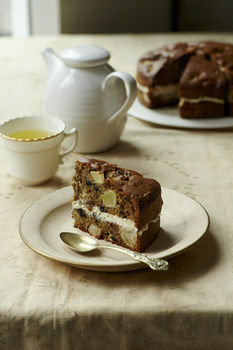 When the cake has cooled completely, remove it from the tin and carefully slice in half horizontally. To make the icing, simple mix the mascarpone and maple syrup until thoroughly combined. Spread the icing onto the bottom layer of cake with a palette knife, and carefully sandwich together with the top layer of cake.